As the French archaeological expedition reviews the findings of 15 years of excavations in modern day Qeft in Qena governorate, Upper Egypt, Ahram Online digs into the town’s folk history. A magic lake, an ancient temple, and all the stories in between them were once, a long time ago, neatly tucked in the heart of historic Qeft. "Next to a location known by locals as 'defaf', [once] lay the Magic lake, one that attracts any birds flying above it and drowns them in it." This is how 15th century historian El-Maqrizi describes it. The 45 feddans of land that once contained the lake is also the excavation site of the French archaeological team that first started their quest some 15 years ago. 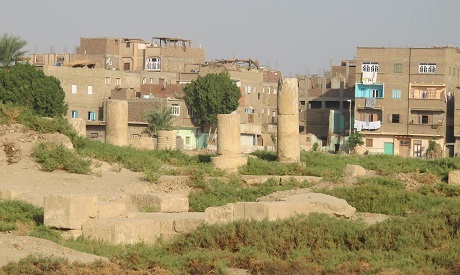 According to Laura Bantalshi, the head of the current French antiquity expedition in Qena, the town remains one of the greatest and most important antiquity sites in all of Upper Egypt. Qeft was unfortunately caught in the line of fire between the Ptolemies and the Romans and many of the monuments were destroyed. Back then, Qeft was a major source of income for Egyptians because it was the closest Nile marina to the Red Sea. "Excavation uncovered the ruins of the pre-dynastic fertility god Min's temple, dating from the fourth era of Ptolemy, a labour room similar to Hathour Temple in Dandara, Qena, and lots of inscriptions referring to the Goddess Isis,” Bantalshi says. King Qaftii, son of Qabtim, also, according to Maqrizi, built the Min Temple very close to the magical lake. Local legend has it that the temple is guarded at night by a brunette woman holding her infant. However, according to Moharam Kamal's book Athar El-Faraana Fi Hayatna (Ancient Egyptians relics in our lives), Qeft, which is also known as Qeptus, was the centre of worshipping the holy trio: Min, the god of fertility, Isis, and her son Horus. Therefore, the lady watching over the temple is probably the remains of a folk legend affiliated with Isis and her son Horus. Unfortunately, the magic lake dried up leaving only a vast space cornered by a school next to a small market place located in Ibn Abi-Talis alley.